A luxurious coastal town, Bal Harbour and the nearby Bay Harbor Islands offer peaceful beachside living and internationally famous shopping. This area may be connected to bustling Miami by a few short bridges, but the city’s urban chaos somehow never makes it onto shore. Bal Harbour is situated at the northernmost tip of Miami Beach, with the Bay Harbor Islands lying just west in Biscayne Bay. 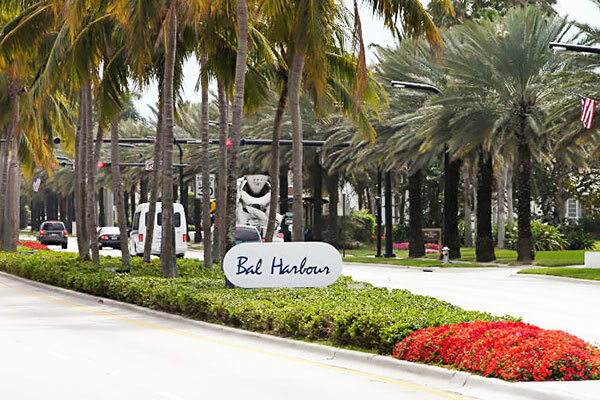 Bal Harbour is bordered to the south by Surfside at 96th Street and to the north by the Haulover Inlet. With just over 2,500 residents, it’s a tranquil and luxurious enclave along the Atlantic Ocean lined with luxury hotels and condominiums, making this stretch of the beach one of the most peaceful and unspoiled. With well-groomed white sand and the aquamarine ocean lapping at its shore, Bal Harbour is the perfect beach for those looking for peace and quiet along an uncrowded stretch of sand. There’s also a beautifully landscaped Beach Walk path that runs parallel to the beach and extends the length of Bal Harbour and south into Surfside. It’s perfect for an afternoon stroll, bike ride or jog. The two main resorts in Bal Harbour are The St. Regis, and The Ritz-Carlton. If you opt to stay in one of these luxurious retreats, you’ll gain access to their beach service, offering everything from lounge chairs to daybeds and cabanas, as well as lunch and cocktails served right to your chair on the sand. Many of the resorts also boast their own water sports offerings, from jet skiing to stand-up paddle boarding. Bal Harbour’s world famous the “Bal Harbour Shops” is an exquisite collection of designer boutiques and restaurants in a tropical garden setting. An internationally renowned shopping destination, it’s a favorite playground for socialites, fashionistas, and celebrities. The selection of fashion boutiques at Bal Harbour Shops includes legendary brands such as Alexander McQueen, CH Carolina Herrera, Chanel, Etro, Gucci, Stella McCartney, Oscar de la Renta, Prada, Tory Burch and Neiman Marcus and Saks Fifth Avenue. The St. Regis features private cabanas, beach services and other special amenities. When you’re ready to take a break from the sand and surf, retreat to one of two heated infinity pools or the adults-only tranquility pool. The expert staff will be standing by to offer foot reflexology mini treatments, smoothies, sunscreen spritzes and cold towels. The 18-story Ritz-Carlton Bal Harbour towers over the tip of Bal Harbour offering an ultra-private experience to its guests and beachgoers. Opt for a lounge chair or daybed on the beach, or get some sun by their swimming pools with sweeping ocean views. With the Haulover Inlet and the jetty along Bal Harbour, the area is sometimes ideal for surfing when conditions are just right. When the waters are flat and tranquil (that’s most of the time), it’s also a great place to put in a standup paddleboard or go snorkeling.